Hello, Brainiacs! New and old, welcome. If this is your first time visiting the Brain, we're happy to have you here and I thought I'd let you know how to get started. 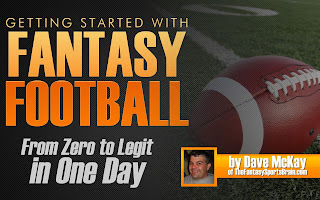 More specifically, I'm talking about the book I launched earlier this month: Getting Started with Fantasy Football: From Zero to Legit in One Day. You can find it on Amazon in Kindle and paperback, and you can also get it here in PDF. The PDF version really looks the best, and for three bucks you can't go wrong. Thanks for everything, Brainiacs! It's been a great year already. I hope you are loving the Team Talk series, and I hope we see you around here all season long. Good luck in those drafts! !